The most comprehensive, practical and user-friendly workbook written specifically for clinicians and educators to engage and support lesbian, gay, transgender, bisexual and questioning youth. Lee-Anne Gray, PsyD, is a clinical psychologist, educator, and author. She is a national speaker in self-compassion, mindful awareness, LGBTQ youth, assessment, special education, and gifted individuals. Formerly an instructor of Psychology of Gender at UCLA, Dr. Gray has served the LGBTQ community as an ally and through her private practice. She is the author of Self-Compassion for Teens and Self-Compassion and Mindfulness for Teens Card Deck. 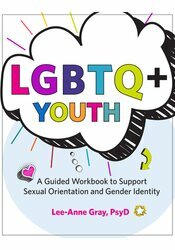 "Dr. Lee-Anne Gray has created a precious resource -- for LGBTQ+ youth; their caregivers, and the people who love them. Written with equal measures scientific rigor and overarching human compassion, this book will inspire hope, raise spirits, and save lives. An essential tool for healing LGBTQ+ youth to flourish, thrive, and triumph." "Lee-Anne Gray's new book, LGBTQ+ Youth, is an indispensible guide for assisting our young patients in coming-to terms with their sexuality, their gender, or both. Seen through an ecological systems perspective, it provides opportunities for adolescents to more fully understand themselves, and promotes ways that we, as clinicians, can facilitate their growth as well as our own. Underneath the practicality of Dr. Gray's approach clearly lies a deep humanity that shines through on every page, exuding not only an appreciation for difference, but a full embrace of it." "This book is a wonderful resource for youth who are exploring diverse sexual and gender identities. The normalizing and validating language communicates that 'who you are is ok!' It is also very comprehensive, discussing a lot of complex ideas and terms in language that is accessible and relatable. For this reason, this book may also be very helpful for parents and clinicians who are working to support LGBT+ youth. The hands-on exercises are designed to help youth foster positive feelings about who they are and to help them to make decisions that are most congruent for them in their journey. LGBT+ youth often feel isolated, and utilizing this book lets them know that they are not alone!" "Get a copy for your pediatrician, therapist, GSA & school counselor today! As a queer-identified transman, parent, and career educator, I recommend Dr. Gray's workbook toe very professional who works with LGBTQ+ youth. Parents and caregivers can also learn much about the needs and challenges of their LGBTQ+ children, especially as they navigate extended family, schools, therapists, and medical practitioners. We must educate ourselves and those in charge of our youth when we are not around if we are to change the self-harm, addiction, and school-to-pipeline statistics that plague our LGBTQ+ youth."